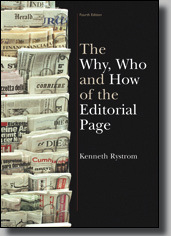 Rystrom, The Why, Who and How of the Editorial Page, 4 ed. Today's editorial writers and editors face new challenges. Their audiences have more education, more sources of information, and access to a wider selection of media than ever before. To succeed, opinion writers must be better prepared and better informed-better writers-than their predecessors. The Why, Who and How of the Editorial Page explains what it takes to be a successful opinion writer. It explores the social and political impact of editorials. It discusses the background, knowledge and skills editorial writers need to produce stimulating editorial pages, deal with publishers and news staffs, and handle potential conflicts of interest. Perhaps most important, it provides step-by-step instructions for writing editorials and shows how letters, columns, cartoons and design contribute to a lively editorial page. Authoritative, practical and current, The Why, Who and How of the Editorial Page is widely regarded as the major text for editorial page writers and students. Reviewed in The Masthead, the quarterly publication of the National Conference of Editorial Writers (NCEW), Autumn 2004. Expanded scope: discusses signed columns and other opinion writing, as well as providing step-by-step instruction for writing traditional newspaper and broadcast editorials. Many new examples: includes more than 100 editorials, opinion pieces and excerpts from a wide variety of newspapers and other sources. Innovations: reflects new approaches that keep opinion pages vital and appealing to readers. Internet resources: explores new research tools and opportunities. Current issues: draws on recent studies and on comments from editorial writers and editors to illustrate contemporary issues and challenges. "The text gives my students an authoritative resource. It provides background on editorial writing, and on how to research and write. And I like the examples in the text." "I continue to regard Ken Rystrom's text as a fine piece of work written by a real pro.... It's the best text I know on editorial writing." "It worked well for me.... Students seem to agree that the book fit their needs." "The practical and theoretical approaches that Dr. Rystrom brings to the subject are major strengths." "Its strengths are its thoroughness and clarity." "Its thorough research is terrific. Its history is most interesting and informative." "The nine steps chapters are very worthwhile as is the general approach." "Overall, it's a good book.... The organization is good; the exercises are excellent!" "It has everything that I need." "It is an excellent all-around basic book on the subject of the editorial page and its role in the newspaper. It covers most aspects of editorial writing and many aspects of running an editorial department. The author's experiences clearly helped him cover all the bases with expertise and understanding." "Rystrom's description of editorial writers is both flattering and challenging. Just when it verges on the unrealistic, he tempers it with a dose of reality. He sets a high bar, but one that is attainable." "Rystrom's book certainly represents well the present-day standards, practices and aspirations of our editorial page and is thoroughly steeped in the standards and practices of the craft in general. Anybody using this book would be well served." "Well done—well written.... It's a good book." Kenneth Rystrom has spent 20 years in the newspaper business and 20 years teaching journalism. He has written and edited editorials on the Register in Des Moines, Iowa, and the Columbian in Vancouver, Wash. He has taught editorial writing and other journalism courses at the University of Montana, Washington State University, the University of Redlands and Virginia Polytechnic Institute and State University. He received a bachelor's degree from the University of Nebraska-Lincoln, a master's degree from the University of California-Berkeley and a Ph.D. from the University of Southern California. Rystrom has been recognized for his contributions to journalism, journalism education and scholarship. For his contributions to journalism and journalism education, he was awarded a life membership in the National Conference of Editorial Writers, an organization for which he has also served as president. For his scholarly work in journalism, he has four times received the Henry M. Grady Award. Upon his retirement, he was awarded professor emeritus status at Virginia Polytechnic Institute and State University. He is now living in Florence, Ore. The third edition of this book was reviewed in The Masthead, the quarterly publication of the National Conference of Editorial Writers (NCEW).